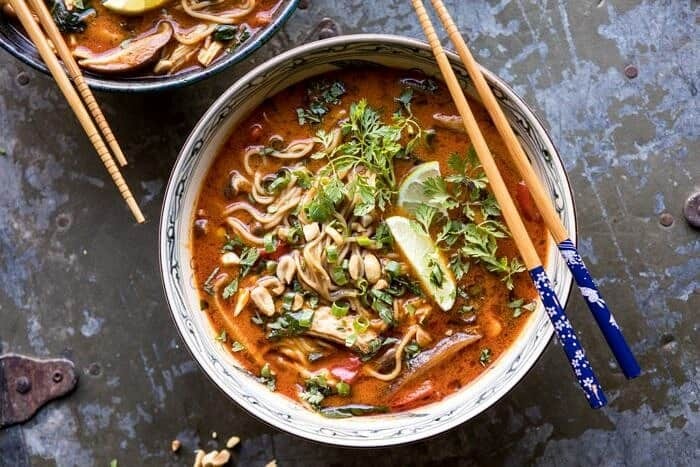 30 Minute Thai Peanut Chicken Ramen. 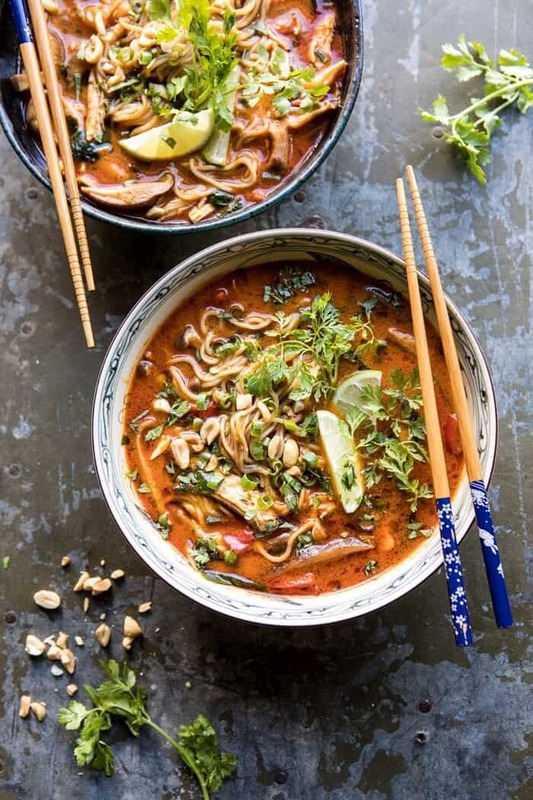 This 30 Minute Thai Peanut Chicken Ramen is for those nights when you need a cozy, healthy dinner, and you need it fast. All made in the instant pot (or in one pot on the stove), using healthy, pantry staple, ingredients. It’s creamy, spicy, filled with veggies, lean chicken, and ramen noodles. Perfect for a cold night in, after a long busy day. It’s official, I’ve entered full on cozy food mode and don’t see myself straying from it anytime soon. Currently all I can think about is slow cooked dishes, creamy soups, pastas, bowls of chili, homemade beer bread, and fall baking. It’s possibly the best thing ever and I’m loving it! We had a cold front move in this week. Monday was dark and stormy almost all day. Our leaves are just passing their peak color, and it’s the perfect fall weather. Soaking up this time before the snow comes and the ground is covered in white…not ready for that. I know I’ve been saying this very often lately, but this is the best time of year. Makes me so happy! I’m also loving the fact that I am finally starting to get a good rhythm going on in the new studio. So far this week I’ve had three solid days of work. Feels really good to be back to my normal self, cooking, photographing, writing, etc, etc. Love a good busy day that feels productive, the best! Moving onto this bowl of ramen which I am so excited to share with you guys. Every fall it’s become a tradition to make a new ramen recipe. This year it’s about this creamier Thai inspired peanut chicken ramen. This is actually a recipe that I adapted from years and years ago, and I’m loving this new fresh take. Plus this version is easier and slightly healthier too. Cool. Cool. Always love easier and healthier without having to sacrifice flavor! I wanted this recipe to be EASY enough for weeknights, but also DELICIOUS. Lately I’m loving using both my instant pot and slow cooker. It was either cook this ramen quickly, or go low and slow with it. Since nothing in this recipe really needs a long and slow cook, I went with my instant pot (which I’ve truly been using every day). SO, add all ingredients to the instant pot, set it to cook for ten minutes, walk away, pour some wine, make a cocktail, fold laundry, scroll the Gram, do whatever it is that you do. Then come back, shred the chicken, add the ramen noodles, cook five minutes, and dinner is done. YES. It’s that simple, and I promise, it tastes great too! As you can guess from the recipe title, this is not your average bowl of ramen. 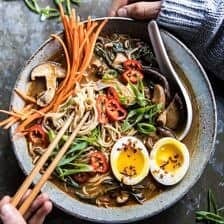 I used some of my favorite Thai ingredients like Thai red curry paste, coconut milk, peanut butter, mushrooms, and bell peppers, to create a ramen that’s a mix of both Asian and Thai flavors. It’s definitely very different, but don’t worry, it’s delicious. 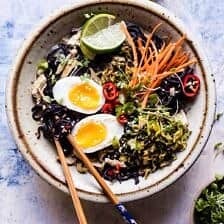 For the actual ramen noodles, I love using Brown Rice and Millet Ramen noodles (which you can find at Whole Foods and in many grocery stores). These taste just like real deal ramen noodles, but they are much healthier, gluten free, and vegan. Also, I recommend storing the soup and noodles separately, then adding the noodles just before serving. If you let the noodles sit in the soup, they will soak up all the broth and become very mushy. 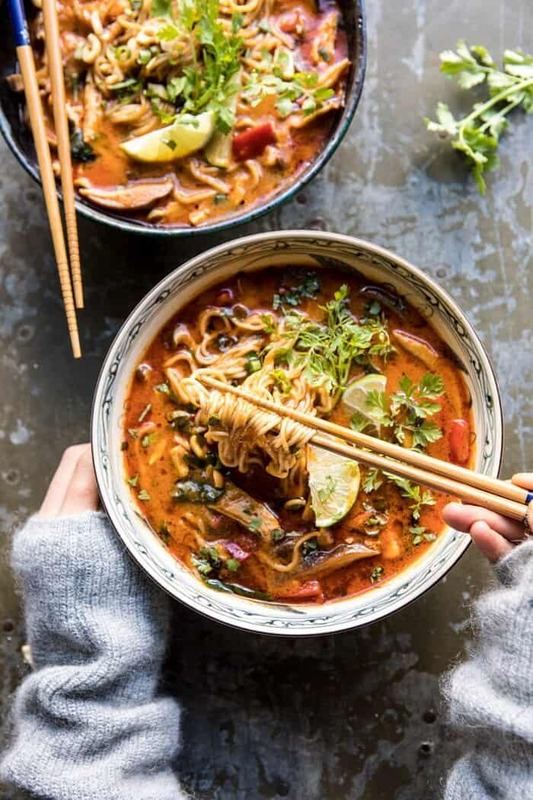 This ramen is perfect for any night of the week whether it’s a crisp cool night, pouring rain, or a night where you just need a healthy dinner, and you need it fast. It’s warm, creamy, peanutty and salty. My current favorite bowl of soup to cozy up with on the couch after spending all day testing recipes, emailing, and running around like a crazy person. I love autumn, but man, it’s always crazy busy! Thankful for easy dinners like this! 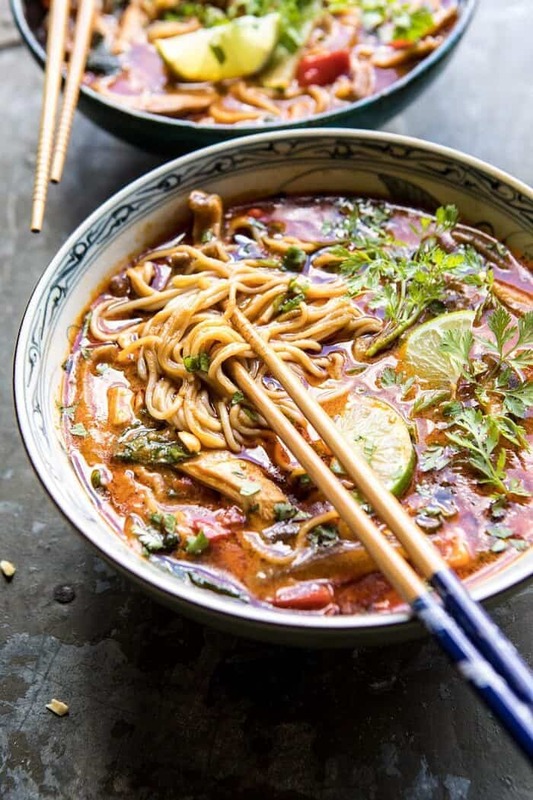 30 Minute Thai Peanut Ramen from Half Baked Harvest on Vimeo. 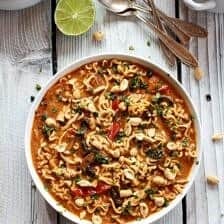 If you make this 30 minute Thai peanut chicken ramen, please be sure to leave a comment and/or give this recipe a rating! Above all, I love hearing from you guys and always do my best to respond to each and every comment. And of course, if you do make this recipe, don’t forget to also tag me on Instagram! Looking through the photos of recipes you all have made is my favorite! All made in one pot, using healthy, pantry staple, ingredients. It's creamy, spicy, filled with veggies, lean chicken, and ramen noodles. Perfect for a cold night in, after a long busy day! 1. In the bowl of the instant pot, combine the chicken broth, coconut milk, soy sauce, fish sauce, honey, peanut butter, and curry paste. Add the chicken, cremini mushrooms, red peppers, ginger, and garlic. Cover and cook on high pressure for 10 minutes. 2. Once done cooking, use the natural or quick release and release the steam. 3. Set the Instant pot to sauté. Shred the chicken, it should fall apart. Stir in the noodles, lime juice, spinach, and cilantro. Let sit 5 minutes or until the noodles are soft. 4. Ladle the soup into bowls and top with peanuts and toasted sesame oil. Enjoy! 1. In a large soup pot, combine the chicken broth, coconut milk, soy sauce, fish sauce, honey, peanut butter, and curry paste. Add the chicken, cremini mushrooms, red peppers, ginger, and garlic. Set over medium heat on the stove and bring to a simmer, reduce the heat to medium-low and simmer 15 minutes or until the chicken is cooked through and shreds easily. 2. Once done cooking, shred the chicken. 3. Bring the soup to a boil over high heat. Stir in the noodles, lime juice, spinach, and cilantro. Let sit 5 minutes or until the noodles are soft. *I recommend storing the soup and noodles separately, then adding the noodles just before serving. If you let the noodles sit in the soup, they will soak up all the broth and become very mushy. Qué buenísima receta Tieghan!!! Soy Ana, de España. Te descubrí hace un par de meses y me encantan tus publicaciones. Enhorabuena por el blog!!! Gran trabajo!!! ¡Hola Ana! ¡Muchas gracias, tan feliz de que hayas encontrado mi blog! How can you say 5 minute prep when it would take 20 minutes to assemble all the ingredients ? Not to mention the grating, measuring, chopping. Hi Susan, sorry the prep time seems off for you, its hard to determine the prep time as it can be different for everyone! I really hope you can still try the recipe. have been making so many recipes (from different blogs) using peanut butter and lately so obsessed with this flavour. This looks so delicious and easy. And so hearty and comforting!!! Trying this super soon. Ah they’re the best recipes! I hope you love mine when you try it! Quick question; What altitudes is the IP cook time written for? Thanks! Oh I love this – only recently gotten into Thai food and I am so enjoying exploring what it has to offer! Thai food is endlessly delicious, so happy your trying it all out… You will love…. most of it! Can this be made freezer-friendly? This looks amazing! I can’t eat spinach so do you think it would be better to just omit it or should I substitute something? I couldn’t think of anything that would have the same texture. Perfect for dinner in windy Denmark tonight! Sooo easy! I love it! Hope you enjoy. To Heather who can’t eat spinach….. I bet baby bok choy would be a delicious substitute! 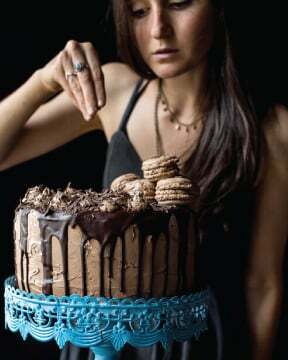 I am so excited to make this tonight! Question – when do you add the lime juice? Just made this – subbed rice for the ramen because we can’t get those awesome ramen noodles for the recipe. So much flavor. It’s delicious food for a fall day. This looks delicious! Will this ramen work well for meal prep or will the noodles start to fall apart after a few days in the fridge? So happy you liked it Kristina! 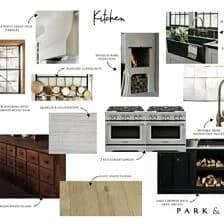 Sorry about the prep time, its really hard to get that right as it takes everyone different times… different kitchens along with where all the food is and what not it can really vary. I wish I could be more accurate with it!! I just fell in love all over again. This is just so yummy! Perfect flavors. The instant pot is perfect for ramen, right? 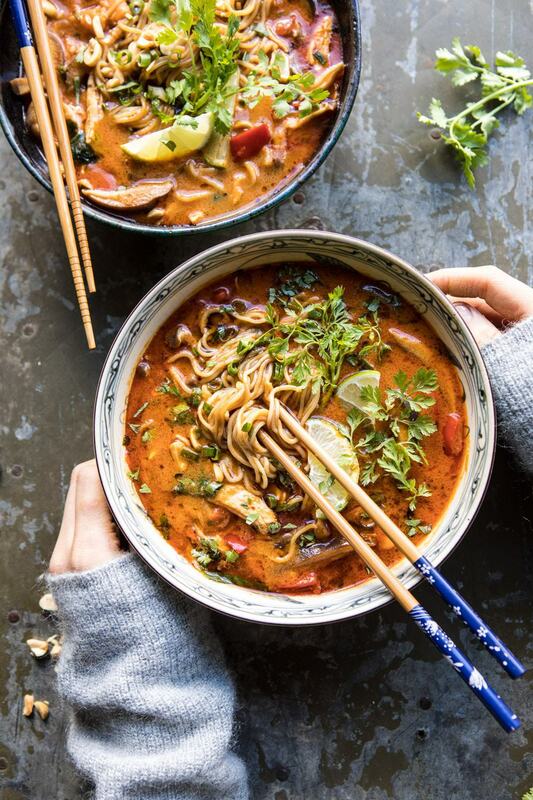 I made a thai curry ramen that is so easy and delicious in the instant pot. I have got to try the thai peanut ramen! I just made this and it is delicious! I have never had Thai food or cooked with fish sauce-which put me off a little by the smell. But this is so good! Plus I love your cookbook! Wow I am so glad you chose this as your first Thai recipe! And I am so glad you loved it! Thank you Katie! I made this tonight, and I have to say it is the perfect cozy supper for cold and flu season! Smells warm, tastes warm, feels warm! Perfection! Everyone around here is fighting off a bad cold bug that’s going around town, so meals lately have been pretty lackluster. No one has had the energy or appetite to attempt making anything significant, but the smell of the spices as this was cooking got everyone to perk up and visit the kitchen tonight, and most of us went back for second helpings. The curry paste I bought tonight on special was quite a bit hotter than my usual variety, so the sauce was VERY spicy. Way too spicy for my little bro, so he opted for a bowl of plain chicken ramen. But even so, he kept snitching noodles out of my pot, then guzzling water, while his was cooking because he said he loved the flavors in this dish, and he didn’t want to miss out entirely. I am so glad you liked this and yes it is perfect for sick days! Thank you so much Kate! Tried this today and it tasted delicious! I just wish my broth wasn’t as thick, I feel like it should have been more soupy consistency. Any suggestions that would make it more of a soup than a creamy broth? Hi! Love your recipes! Since I don’t have an Instant Pot, is this something I could make using a Slow Cooker or a stovetop soup pan? Made it with bell peppers. It wasn’t until I was serving up that I realised it was possibly chilli peppers instead…? Doh! We made this Thai peanut chicken ramen and I must say it was super tasty. Loved the one pot cooking and the ease of ingredients. Excellent! However anyway I can relate the cup measurements to weight? Can natural peanut butter be used? The one that you mix the oil and peanut butter separation together? I made this recipe a couple nights ago. It did take me longer than expected to put it together but I’m sure it will go faster as I make it more often. Fairly healthy, yummy, simple, great flavor. We loved it. Also, I really like that I could use my Instant Pot. Yes, I will be making this often! It was delicious and will definitely hit the spot this fall and winter. Thank you! Thank you Jennifer! I am so glad you loved this and it turned out amazing for you! I made this last night! I dusted off the Instapot and WOW!!! Huge hit! 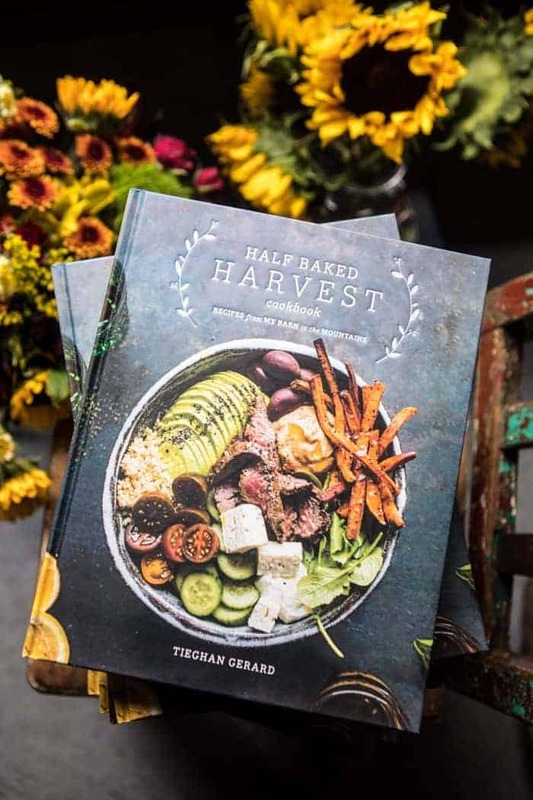 My boufriend asked me where I got the recipe, and I said the only place I ever get recipes anymore, Halfbakedharvest.com. Thank You for another quick winner!!! I love this!!! That is so sweet! I am so glad you and your boyfriend enjoyed this recipe, Kristi! Thank you! Wonderful soup! This was a HUGE hit at my house. The only thing I did differently was I cooked the separately so that the leftovers wouldn’t be mushy. It tasted amazing the next day as leftover lunch! Great recipe. Love this recipe! It’s so easy and cozy. 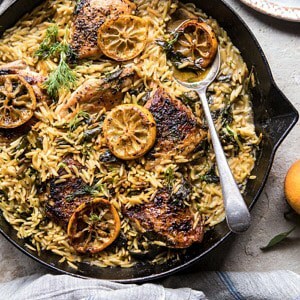 Perfect for fall weeknight dinners! Delicious flavors! I purchased my InstaPot to make this dish, and think I’m going to love this new tool. My modification would be to add 3-4 chicken breasts and garnish with cilantro versus the basil. 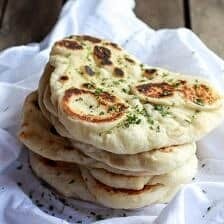 Some garlic Nan bread would be a nice complement to the dish. Makes enough for leftover night this week. Yummy!!! Thank you Rosann! I am so glad you are loving this recipe and I hope its just as good leftover! Delicious flavours. Agree the prep time was longer than expected. I made the stove top version and had to substitute the noodles. I think I may have put too many noodle in as the noodles absorbed quite a bit of the soup base? How many grams of noodles would you recommend? I made this on the stovetop, delicious depth of flavor for a quick soup. However, I would decrease ramen blocks to two, the noodles absorbed all the soup base, although delish it was too thick. I roasted the mushrooms & peppers before putting them in the soup. I would double all veggies & add more garlic & ginger. I also would up the spice factor. I would also increase the amount of chicken. Topping with peanuts & cilantro added to the yummy factor! Thanks for the recipe, will make again for sure!! Thank you Joyce! I am so glad you loved this recipe! Do you boil for 5 min or just bring to a boil- add the next few ingredients and then turn off boil and let sit for 5 min? Just finished making the Thai Peanut Curry soup. Easy and delicious, but I really had to amp up the condiments to eek out a little umami (doubled the fish sauce, curry paste, soy), plus I added a bit of sriracha for a bite. And substituted tofu for the chicken. Thank you!!! Just made on stove Thai peanut chicken ramen! I could eat every day! I adjusted slightly…my chicken was cooked and I used less. Could eliminate entirely really. One less pepper and one less ramen noodles as I like little more soup! It was perfection. Flavors rediculous? Will be making this often! Quick and easy if you have all ingredients! Thanks for all your recipes! Thank you Jane! I am so glad you loved this recipe! I just made this soup tonight and it was amazing! My husband said it was the best dinner I have ever made (he had 3 bowls of the soup!!!) . The only con was that it took me 60 minutes from start to finish and not the 30 minutes advertised (I don’t have an instant pot and cooked it stove top). It was so good though I definitely would make again! Thank you Melissa! I am so glad you loved this soup! This was delicious and so easy! Omitted the chicken and doubled the mushrooms. Will definitely make again soon. Easiest recipe I’ve ever made and so good! This soup is everything you could ask for on a cooler night. So much flavor in such simple ingredients. Five stars! Hello, is it correct to put the raw chicken into the soup? and then take it out, shred it, and put it back into the same soup? Brilliant! We loved it.Thank you. Happy to hear that! Thank you David! I am so glad you both loved this Marcia! Thank you! Hi! If I already have shredded chicken prepped when should I add that in (I’m cooking on the stove)? How would it effect other cooking time? Is it just me or does the instant pot always take twice as long as you think by the time it heats up and releases steam? Regardless, this recipe was INCREDIBLE!! The sauce was super creamy and the chicken was incredibly tender and flavorful. I have been sitting at work dreaming about my leftovers for tonight! This one will definitely be on heavy rotation!! I am so happy to hear that Rebecca! Thank you! Made this last night….sooooo good!! We loved it!! I did the stove top method. It will definitely be a regular in our house. What IP do you have? I think I might need to get me one of those! Hi Susan! I am so glad you loved this! I have the Instant Pot brand and it is 6 quarts. Omg this was the bomb!!! Not a crazy amount of prep although it definitely took me more than 5 minutes. Overall though it was very easy and SUPER delicious. This is my first of your recipes to try (although I’ve saved a bunch on Instagram) and I can’t wait to try more!! P.S. this is the first review I’ve ever written so you know it must have been good! I am so glad you loved this Kate! Thank you so much! I am so happy to hear that! Thank you so much Nina! This was seriously so good! Love that I could use my instant pot to create such great flavors in such little time! Ps super excited to eat my leftovers for lunch tomorrow! Thank you so much for this blog and particularly this fabulous recipe Tieghan! This was my first ever Thai dish and it was delicious! My dear, amazing cook, friend, who is a long time fan of your’s, sent me this link and told me this recipe was AMAZING!. Never having cooked Thai, It took me all week to gather the ingredients and 2 hours make, prepping the ingredients. However, it was totally worth it as my very picky eater husband and I loved it! (I did not tell him it contains fish sauce as he hates fish). I added chopped bok choy and cooked the Millett/brown rice noodles separately and when rinsed added some roasted sesame oil as suggested by my friend. I will now we following your blog and trying your recipes too! I made this dish last night and yum! We prefer thicker soup so I left the noodles in a bit longer and it was just great, everyone enjoyed it. The lime juice gives a nice twist to all these flavors, next time I’ll try it with tofu or shrimps. Thanks Tieghan! Thank you so much! I am so glad you enjoyed this Anaïs! I am so glad you loved this Elsa! Thank you so much! Made this on Saturday night for a friend and my boyfriend and we all LOVED it!! I added eggplant too (because I love eggplant in anything with curry!) and it worked out perfectly. In the future, I think I might make the noodles separately and add them to the veggies/chicken/broth before spooning out. They ended up absorbing most of the broth, and now there’s no broth left for leftovers. No big deal though, I’m just going to make a pot of the broth tonight for the little bit I have leftover and freeze the rest! I am so glad you and your boyfriend loved this Ashley! Thank you so much! This looks like a great recipe! I can’t wait to make it tonight. The recipe calls for the juice of 1 lime, and the images show lime wedges in the ramen. Do you juice the lime and then add in a wedge per bowl? Or, do you cut into wedges, squeeze into the ramen and plop the wedges into the broth? Or, do you add whole wedges and allow for the juices to be extracted? Thanks! This was so easy to make and absolutely delicious! It was a huge hit and I’ll definitely be making it again! Love love love this! So yummy and easy! Tieghan! Just made this tonight with my boyfriend and it was delicious! We were both big fans! Thank you Susan! I am so glad these turned out so well for you! Hi! I don’t have an insta pot but I have a slow cooker. Can I still make this recipe? What do you recommend changing? Do you have directions for this recipe using a slow cooker? I only saw the instapot or stove top. Looks delish!! Love all of your recipes ! This was AMAZING! Loved how easy it was to prepare and how delicious it was to eat! My four year old requested that we eat it again, so I’ve just added it to next week’s meals. Thanks for another great recipe. I am so happy to hear that! Thank you so much Beth! I really hate mushrooms. Should I substitute with something else or just leave them out? As soon as I saw this recipe on your Instagram the other day I flew onto Amazon and ordered an Instant Pot (I got a Mealthy one). It was scheduled to arrive today so I shopped for this recipe and made it using my Instant Pot for the first time. My boyfriend and I FLIPPED OUT eating this dish. It was absolutely insanely delicious and unique, hearty yet somehow light, and hit every note on the tastebud scale. Plus it literally took LESS than 30 minutes to prep and cook… it honestly would have been even less if I didn’t count the time it took for the Instant Pot to preheat. The only thing I’d do next time is to cook the noodles separately so we could save leftovers without the noodles in them (because we will ABSOLUTELY make this again…and again….and again). Thank you for such an amazing recipe! OH MY GOODNESS! This is so amazing and sweet! I am so glad you and your boyfriend loved this recipe, Rachel! And I hope you’re loving your new instant pot! Hi Tieghan! I made this tonight, and it was delicious! I also loved that it was naturally gluten and dairy free, so my fiancé could devour it up too. 🙂 Question for you, I over boiled the broth, and now it’s a bit too thick. Any suggestions for how I could thin it out after cooking? Thanks so much! How would you recommend making/storing this for meal prep? I’m planning on making this for my lunches. ok I never leave comments but I just made this and OMG! SO GOOD. I’m already planning to make it again and double it. I eliminated the honey and used shirataki noodles (trying to be low carb) and it’s perfect. I think there’s lots of variations you could do with this too- different veggies to your liking and it would be really good with shrimp I bet. Thank you!!! I am so happy to hear that! Thank you Natalie! This was amazing, but a bit too spicy. Had to add more coconut milk. I will make it again lessening the curry paste. Total keeper. Thank you so much Sandi! I am so glad you enjoyed this and hope you enjoy it more next time! Amazing! I have just made it here in the UK – for anyone else making it here 1 cup is 240ml 🙂 thank you so much for this recipe. I added a fresh chilli to give it a kick. So tasty! I am so happy to hear that! Thank you Damian! I have a peanut allergy but really want to try this dish! What do you think about substituting peanut butter with soy butter alternative or should I just try it with out a peanut butter substitute? Thanks so much! I am so glad you liked this Kristen! Thank you! I love Thai food and all the flavors in this soup, BUT I can not have peanut butter. Any suggestions? Or just omit? I made the stovetop version last night – so easy and delicious! Looking forward to making some recipes from your beautiful cookbook. Many thanks from Canada! Thank you Kristen! I am so glad you like this! I made this recipe in the crockpot and it tasted excellent! The flavors worked well together. This is a keeper! This looks delicious! My hubby can’t eat mushrooms- any suggestions for a replacement veggie? Thanks!! Just made this last night – amazing! Followed the recipe as is with omission of red peppers. So good, so easy, will definitely make it again. This turned out amazing! All my favorite flavors. Do you think this would work with light coconut milk? Wondering if I can keep it a little healthier in the future. Does the chicken really cook in only 10 minutes in the InstaPot? What setting do you use on the pressure cooker? Delicious! We’re not mushroom fans, so instead of mushrooms I added a similar quantity of snow peas (added with the noodles at the end) to keep the vegetable content adequate for a meal on its own. We also liked it served with sriracha! Wow! This was wonderful. All of the ingredients just came together in a savory soup that warmed my soul! This was also my first Instant Pot meal! This was great and fairly quick to put together with what I had on hand. It was so easy to use the packaged ramen noodles with homemade broth. Thanks! I’ve made this twice so far and it is excellent! I love the flavor profile and the back-ended heat from the curry paste. The second time I made it, I kept out the ramen blocks and added them when I took it for lunch or as leftovers for dinner, it kept the noodles from getting too squishy the second time around. Thank you so much Cait! I am so glad you are loving this recipe! This was delish!!! Making it again soon. It was a tad salty. But so good. Made this last night and it was a HIT! I think next time I will only use 3 packets of the ramen noodles instead of 4, but will definitely make this again, probably in the next few days! 🙂 It’s THAT good! PS – thanks for the instant pot recipes, keep them coming please! I am so glad you loved this Nadia! Thank you so much! This was the most amazing soup I’ve ever had or made! Wow! That is so great to hear! Thank you Peter! Oh my goodness this recipe is so good! I made it with red bell pepper (which I’m pretty sure is not what was meant by red pepper now that I’m re-reading the recipe) but it’s still really good. My 16 month old even ate a small bowl and is running around munching on chunks of chicken from the soup. I will definitely be making this again! Thank you so much Emily! I am so glad you loved this recipe and it turned out amazing for you! Can this recipe be done in a crockpot? If so, how long do you think it should cook on low? – i wish you have noted in the actual recipe that for meal prep purposes, the noodles should be cooked and stored separately. You have stated this in the comments, but it would have been helpful in the recipe. I cooked it all together as per the instructions, and today it’s a gross mushy mess. The broth is completely absorbed and it basically tastes like instant ramen. Such a shame after spending 1.5 hours cooking this last night, and only getting one good portion out of it. i’m tempted to just throw it all out now because it’s sooo noodle-y. – i’d decrease the amount of ramen – 4 squares seems excessive and it overpowered the other wonderful flavours. Most of these comments have been made by others as well, so I think you should incorporate them and update your recipe accordingly. these inaccuracies make me hesitant to try another one of your recipes. Ok this was amazing! BUT. The calorie count above says 243 calories for 1/6 of a pot and when I put the ingredients into a calorie counter it is MUCH higher than that. What are you using to calculate this? This soup was delicious and I was able to find the brand of ramen you linked at Target. However, I spent $7 just on the noodles and I was wondering if I could just sub spaghetti cooked separately next time. This is amazing! I had my husband and his friend eat half of it and couldn’t stop talking about it. Next time I’ll add a bit more spice. Thank you so much Gretchen! I am so glad you loved this recipe! Those asking about spinach – I subbed for bok choy and it came great! I threw the stems in with the rest of the veggies and the leaves in with the noodles. It worked pretty well! Thank you Caitlin! I am so glad this turned out so well for you! This may be a dumb newbie instant pot user question but any reason why you can’t half the recipe? I probably wouldn’t want to make 6 servings! Although I guess you said you could freeze it. Do the veggies, peppers, spinach really freeze well? I made this as is and it was amazing! My husband and I added chili garlic paste to our bowls for an extra kick! It was so good and so easy!! Ooo yum! I am so glad you both enjoyed this Jaime! Thank you! I just love your blog, it is so well presented- beautiful and easy to follow. You have such a gift! This is so sweet. Thank you so much Lauren! I want to make a yummy homemade bread with this…any recommendations of what would go well? I’ve made your cheaters sourdough about a hundred times, so so so good. I am so excited to try out this recipe! Wondering how spicy it is…I love Thai food but am a bit of a baby with spice/heat! Hi! This looks so yummy! I was thinking of making this for my three year old. Is the red curry paste spicy? This dish is fantastic. Comes together quickly and tastes like it was made in a restaurant. I modified it just a bit – added 1/4 cup sriracha and used rice noodles instead of ramen. Thanks so much for this recipe!!! Thank you so much Garima! I am so glad you loved this recipe! I made this ramen the other night and raved to all my coworkers about it. It came out OUTSTANDING. I did add 2 cups of water to it as I read the broth came out a little thick and I like soupier ramen broth. Also added a little extra soy sauce and added in about 2 tbsp of red chili paste to give it a kick. I baked my chicken breasts separately and shredded them and added them to the broth at the very end. Definitely will make this again. Super easy and made great leftovers! Thank you so much Victoria! I am so glad you loved this! We made this last night and it was really delicious! Thanks for posting. Made this tonight! So good! 🖤🖤 Made my husband extra happy. Thank you!! I am so glad you both loved this, Hailey! Thank you! I found this recipe on the HBH Instagram feed and decided to take it for a spin. Two things I like about this recipe: 1) It’s super fast – perfect for a weeknight. 2) I usually have all the ingredient on hand. I followed the recipe exactly for the Instant Pot, but held the noodles out. I cooked authentic fresh ramen noodles (Sun brand) and topped them with the curry mixture. Fantastic. My spouse and two kids loved it. Now that the cold weather has set in, this has been on our menu rotation and we’ve enjoyed it multiple times. Wonderfully soothing flavors and the red curry punch is fantastic. Thanks Tieghan! Hi Dave! I am so glad you decided to try this recipe and it turned out amazing for you! Thank you so much! YUM! I am so glad you loved this ramen, Marie! Thank you! I’ve made this three times already because my household is obsessed with it. I hate bell peppers so I add shredded carrots in the last few minutes of simmering and use baby bok choy instead of spinach. I also add a kefir lime leaf and offer chopped green onion as garnish (I love, some don’t). Otherwise pretty much exactly as is. I am so glad you and your family loves this recipe, Caitlin! Thank you so much! Excellent! My husband and I love Thai food, so this recipe definitely peaked my interest. I forgot to add the red peppers, so I think that would be the icing on the cake. It’s super easy, super flavorful, and it’ll only get better the more I make it. Thank you so much Amy! I am so glad you loved this ramen recipe! That is so great! Thank you so much Chrystal! I made this soup tonight and am eating it, just amazing. What flavours. You may remember I congratulated you when your brother won at the Olympics, and that my son ( Chris Rasman,, a fellow snowboarder with Quicksilver) has met him and says he Red is great person as well as an amazing athlete. I told him his sister is a famous food blogger. Thank you for your great recipes, I am going to get your cookbook, can’t wait! Ah that is so amazing! It is so great they have met! Hopefully I can meet you guys at a competition this season! Anyway, I am so glad you love this recipe, Linda! Thank you! I have severe GERD but my husband loves spicy food. On a scale of 1-10, how spicy would you rank this? Is there a way to tone down a notch or two so both of us can enjoy it? If you don’t have an instant pot and would prefer to use a crock pot instead of a pot on the stove, is that still an option? Crock pots are just so much easier! I made your Thai Chicken Ramen recipe as my first recipe in new Instant Pot. Success!!! It is delicious! Looking forward to amny more recipes. Thank you!!! I am so glad you loved this recipe Diane! Especially as your first! Thank you so much! I made this last weekend and it was EXTREMELY delicious. Easy and fast to make too. I can’t wait to make it again. Thanks! Made this for dinner – it was outstanding! Great flavor! I am so happy to hear that Laura! Thank you so much! I made this for dinner when we had some friends over. It was a huge hit! My girlfriend was texting me the next day for the recipe. This is definitely going to be one of my go to recipes from now on. That is so amazing! I am so glad everyone loved this recipe, Marissa! This was ah-mazing! 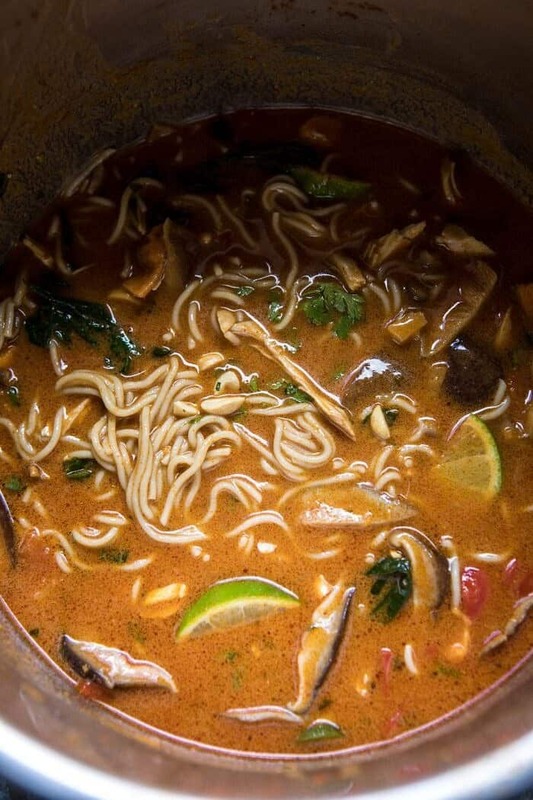 I added lemongrass and Thai chilles, which enhanced the flavour, and I absolutely loved this! Thank you so much Ashley! I am so glad you loved this recipe! Soooooo good! I can’t wait to make it again! I am so happy to hear that Tara! Thank you so much! Success for the entire family!! I didn’t have Ramen noodles so I decided to go with brown rice instead. It was delicious. Can’t wait to eat the leftovers tomorrow! Thank you so much Joanne! I am so glad you loved this recipe! This recipe is great and very easy to make and won rave reviews from everyone in the family. I will mention that I used boneless chicken thighs and increased the amount from 3/4 lb. to just under 1.25 lbs. and it still seemed a little light on meat. You may or may not find that this is the case but I was feeding two men one of which was a teenage boy. Next time I’ll probably add at least 1-1/2 lbs. of chicken to the recipe. I also added additional fresh ginger to the above recipe (can’t have too much ginger). Do yourself a favor and make this delicious meal on a cold winter night, you’ll be glad you did. This soup is amazing! Loved it! I followed the recipe to a T except used no sodium chicken broth instead of low sodium. It was still salty enough with the soy sauce and fish sauce. I am so glad you loved this soup Jodi! Thank you so much! I am so happy to have found your website! I made this peanut curry last night and it was so unbelievably delicious! I’ve been searching for a delicious peanut curry recipe for years now and finally I’ve found it!! Thank you so so much! Really excited to try your other recipes! Hi Lindsay! I am so glad you loved this recipe! I hope you love every other one you try as well! Thank you! Delicious! Comforting! Super Easy! Will definitely make again 🙂 My only regret is that I forgot to buy peanuts to put on top. I think the addition of a crunchy texture would have made it that much better (so don’t pull a me and forget them)! Hi Britton! I am so glad you loved this and I hope you love it even more with the peanuts on top! Thank you so much! Really good! Unfortunately I didn’t have fish sauce and thought I did. I used more soy sauce, I think the dish could have used the funkiness of the fish sauce. So, don’t skip the fish sauce! 🙂 Otherwise, it’s warm and comforting and still really good. Thanks! Thank you so much Michelle! I hope you try this again with the fish sauce! This looks amazing! Can it be made in a regular crock pot instead of an instant pot? Oh my gosh, made this tonight and it’s going to be a new go to for me. And it takes a special combination of ease + taste for me to deem it a go to. Followed the recipe just as stated. Was a little scared by the amount of Red curry paste but it was perfect for me, a spicy lover (and my husband that doesn’t like things too overwhelmingly spicy). Thanks for sharing, I LOVE! Made this for dinner tonight and normally my husband snivels when I make soup. I was extra excited as this was an instant recipe and I just got one. So easy to follow and make. My husband loved it and shared some with his friends (almost didn’t leave me any). Said it was full of depth and flavor. I agree it was really good esp for how easy it was to prepare. Thank you so much! I am so glad you and your husband loved this soup, Alex!! Thank you Sara! I am so glad you loved this recipe! This sounds delicious, but curious how do you cook the chicken before adding it to the broth? I look forward to making this soup as the reviews are outstanding. I’m vegetarian (but eat fish) and was wondering what protein you recommend using? Could you freeze this soup after making it and warm up later? With the noodles separate from the broth. I have a soup exchange I’m going to and I think this would be perfect addition but we bring all the soups frozen. I made the mistake of buying red bell peppers too, ugh. Hi Virginia! I am so sorry about that. I will make sure the recipe is more clear! Oh my, I never comment anywhere, but I had to for this — it was amazing! I’m a newbie with the Instant Pot, and not the most nimble of cooks in general, and even I found this ridiculously easy to put together. Thank you so much for a wonderful recipe! Thank you so much! I am so glad you loved this recipe! Now I’m confused. What kind of red peppers are recommended? Thank you! This recipe is amazing!! Can’t wait to make it again with my new instant pot. My daughter added a fried egg and said it was delicious! Thanks for the recipe! Yum! I am so glad you all loved this recipe, Carla! Thank you! Omg is this good!!! I substituted Liquid Aminos for soy sauce because I ran out of soy sauce, and the toasted flavor was on point!! My husband loves spicy flavors so he added a little bit of Siracha chili sauce on top. I am so glad you loved this Ann Marie! Thank you so much! I always get confused when to use full fat coconut milk or low fat etc. which coconut milk did you use for this recipe? Hi Jessica! I am so glad this turned out so well for you! Thank you for trying it! I made this for dinner tonight for my family, huge hit! It was so delicious! The only thing I did differently was use baby Bella mushrooms because that’s what I had in my veggie drawer. Anyway, thank you for the recipe! Cheers! I am so glad this turned out so well for you Lorelei! Thank you! Hi Jessie! I am so glad this was a perfect meal for you both and I hope you get well soon! Thank you! Absolutely delicious AND easy to make! The whole family love it and we can see why it was the top recipe for 2018. This was incredible! I want to eat this every day forever! Thank you so much Caitlyn! This has become a top 5 favorite for my family of 5! Needless to say I need to double the recipe. I was previously using the stovetop method so it didn’t affect it at all but I’m wondering if the timing needs to be adjusted when doubling an instant pot recipe? Thank you so much for sharing your incredible dishes! About 50% more noodles than the recipe calls for makes this one of my favorite recipes on your site. The others are correct: there is an up-front time investment in prep, but most Asian dishes require lots of chopping and gathering ingredients – your skill with a knife determines how much time it will take. Give yourself an hour and you will have plenty of time to have this dish ready to serve. Very tasty. 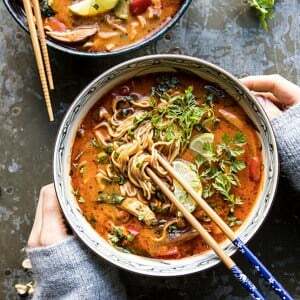 If you enjoy this, try the Pork Ramen Soup (with acorn squash) – but save it for the weekend. It takes a bit more time to put together. Thank you so much Michael! I am so glad you loved this recipe! Made this tonight – what a great way to start the New Year! All four of loved it! Thank you so much Kris! I am so glad you loved this! Can this be made not in the instant pot? We made this last week to break in our new Instant Pot – OMG it was so good. This is definitely going into the rotation! Thank you so much Chrissy! I am so glad you enjoyed this recipe! Sooooooo good. Ate almost the whole thing with my husband. I made this tonight and my bf goes, “This has to be the best meal we’ve made in a while, if not ever.” Was delicious! I have made your brownies and the lemon butter chicken! Everything has turned out great! Thank you! I am so glad you both loved this recipe Rose! Thank you! Big fan here – however the chicken really didn’t feel like it was done. At least was not falling apart nor did it shred easily. Also would modify this recipe to read longer to prep as commenters have suggested. Thank you so much Kaitlyn! Followed the recipe to a T – this was amazing! Whole family loved it, and I can’t wait for the leftovers!! Hi Molly! I am so happy to hear that! Thank you so much! Thank you Justine! I am so glad you loved this! You’ve outdone yourself on this one! Wow! My store was out of the Thai red curry paste so I subbed in Thai roasted red curry paste. I will be making this one time and again! Thank you so much Kristen! I am so glad you loved this! This was delicious and SO EASY! I added 3 Tbs of sambal oelek because we like things a little spicy, and it was just perfect. Can’t wait to make this again! Could we substitute the curry paste for curry powder?? All I have in my pantry is yellow curry powder…do you think that would work for this recipe? Thanks! This is probably my all-time favorite recipe. I don’t generally leave comments but I have made this so many times in the last couple of months it seems unfair not to. Thank you! Based on other comments I do add about a cup of water before I add the last 4 ingredients at the end, and it is still incredibly flavorful. 2) I could make it while my kids started their bath and then while it cooked in the IP I could finish up bath time, get them dressed and set the table. 3) My 3 and 5 year olds both willingly ate it with relish!!! I had actually prepared plain ramen just in case they balked at it and there was no need for it. No complaints, no whining, just noodle slurping and drinking the broth straight from the bowl! This is sure to be a new staple in our house! This is so sweet! Thank you so much Kelly! I tried this receipt tonight and was super delicious I really like the mix of all flavors ! Can’t wait to try others . Thank you so much Amande! I am so glad you loved this! I made this last night for a small dinner party and it was SO GOOD! Everyone had seconds! It has just the right amount of spice, sweetness and citrus and it was so easy to make. I put all of he ingredients in the pot and stuck it in the fridge u til my guests arrived. 10 minutes later, dinner was served. I would suggest using only 2-3 ramen noodle sheets instead of 4. I put 4 in and it really sucked up a lot of the soup. I’m definitely going to make this again. I might try it with rice next time. I am so glad everyone loved this Lara! Thank you so much! That is so amazing Tara! I am so glad your family loved this meal and I hope you continue to enjoy other recipes as well! Thank you!! This looks so yummy! How can I make this in a 3 quart instant pot? I m planning on making this recipe for dinner, but I’ve got a bunch of kale I want to use before it goes bad. Would you add it to the soup in the same way as the spinach? Made it twice! 1st time w too many noodles.. Way too many… It was no longer soup…lol but still really good. 2nd time added more veggies and used rice noodles.. Still awesome! Omg YUM! I just made this for my fam and it’s so delicious. Seriously good stuff, it’s the first ramen I’ve ever tried (cooked or tasted) and I LOVE IT thank you!! I am so glad you loved this Heather! Thank you so much! Thank you so much Jo! I am so glad you loved this! Thank you so much Daryl! Wow! This is delicious just as the recipe is written. Thank you! Trying this in a slow cooker today instead…Any suggestions? Hi- I plan on making this tonight and was wondering g if I can’t find the ramen noodles you recommended. Is it alright to use the chicken or oriental noodles I find at the grocery store? Or what would your recommendation be? Thank you for this recipe! This was the first recipe i made in my new instant pot! It took a while to make but it was absolutely incredible! 5 out of 5 stars, hands down. Pro tip: make your own thai green/ red curry paste and freeze it in an ice cube tray. Makes a huge difference when you add your own to recipes. Thank you so much Laurie! I am so glad you loved this! This was sooooo easy and absolutely amazing!!!! Thank you so much Janette! YUM. Made this tonight and I ate 3 bowls. 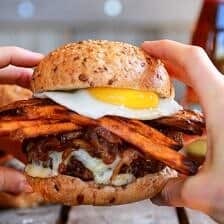 Your recipes always look and taste incredible and are quite unique from anything I see scrolling pinterest. It’s hard to explore other food blogs when everything I make from yours turns out delicious. Thanks! Looks awesome for tonight’s dinner:) have u ever substituted almond butter for the peanut butter? I LOVE this recipe!! It was so easy to make and so full of flavor! My 2.5 year old daughter gobbled it up and told me “this is delicious soup Mommy!”. Definitely going to be making this again soon! I am so happy to hear that! Thank you so much Megan! This is so sweet, Amy! I am so glad you have been enjoying my blog and also my recipes. I am so happy to hear that!! Thank you so much! Do you ned to increase the cooking time in the instant pot if you double this? Amazing and so easy to make.. I use more red curry paste to give it a little more flavor but other than that this recipe is on point.. my family loves it and I make it at least once a month!! Thank you so much Gary! I am so glad you loved this recipe! I made this dish the other night and it was SO yummy! The flavor profile was perfect. Pretty spicy, but I liked it. Excellent dish! I might try leaving the chicken out next time and doing soft boiled eggs. Thanks for the recipe! I am so glad you loved this Noelle! Thank you so much! SO GOOD! I’m a beginner when it comes to cooking and the Instant Pot saved my life. This dish was so flavorful and tasted super complex. It was easy and everyone loved it. I am so glad everyone loved this Amanda! Thank you! Just made this for dinner! It is crazy how much delicious flavor you get in such a quick meal!! I added a little half and half to make it creamier just to try it that way, but even without that it is a winner!! I’ll definitely be making this again!! I am so glad you loved this Alison! Thank you so much! Do I add the shredded back to the pot when you bring it to boil with the noodles? Hello from Vancouver BC! Made this last night for the family, followed the recipe and everyone gave this a 10/10! It was delicious and I will be making it again! That is so amazing! Thank you so much Tami! Out of whatever is left after you’ve eaten? Made this for dinner tonight, and Wow!!! Delicious!! We all loved it and will definitely make again. Thank you so much Natalie! I am so glad you loved this! I am new to the Instapot to which I now am calling “Magicpot.” I couldn’t believe how easy and fresh everything tasted. We made it last night for dinner, and my husband must have said at least 8 times how good it is, plus he had 3 big helpings for more. We will definitely be making this again. Thanks so much!! Thank you Jess! I am so glad you loved this! Hi! Planning to make this week. Hubby loves Thai food. My daughter and I can’t have very spicy (heartburn for me during pregnancy). Would you recommend using less curry paste or something different? I’ve had my instant pot for awhile now and this seriously is the best thing I’ve cooked in it! The only thing I did different was instead of spinach I used bok choy. This recipe is definitely a keeper! Thank you!! I have been making (and loving) recipes from this blog for years, but I can honestly say this is one of the BEST recipes yet! It is so simple, and the flavor is just amazing. My husband is already asking me to make it again, even though we haven’t even finished the leftovers yet! I think this dish is even better left over. I stored it with the noodles in, and did not find that they got too mushy. Thank you for another FANTASTIC recipe! I am so glad you loved this recipe Marie! Thank you so much for your continued support and I hope you love all other recipes you try! Just made this last night- it was AMAZING! It was also my first time using my new Instant Pot- so it was a real win for a Tuesday. =) Thanks for the yummy recipe! I am so glad you loved this Alexis! Thank you so much! I made this for my family last week and it was such a hit, specifically with my 9 year old that it has been requested again tonight. The flavors were amazing and the instant pot made it so simple. I am so glad this turned out so well for you, Olivia! Thank you so much! I am so glad you loved this Becca! Thank you for trying it, especially as your first meal in the instant pot! Made this for my boyfriend and he loved it – thank you! It’s a bitter cold outside right now, and this was the perfect bowl of delicious warmth to cozy up with! Thank you so much Natasha! I am so glad you loved this! I’ve never rated a recipe online, but felt compelled to give this one the public praise it deserves. Absolutely delicious! I cooked it for dinner and we’ve eaten until we can eat no more- which is fabulous because that means leftovers! I just spent about two hours scanning your recipes and found the link to the cookbook that I’ll be ordering this evening. We eat “clean” and I’m so thankful to have stumbled upon your site. Thank you! I made this and absolutely loved it! I like my ramen type soups with lots of veggies so I added bokchoy, matchstick carrots, snow peas, and bean sprouts. It was a major hit in my house. Thank you so much Kristin! I am so glad you all loved this recipe! This was amazing, I love ramen & Thai curry so thought this would be good to try. I changed a few minor things, I used vegetable broth (boiled veg scraps in slow cooker), quorn fried off and added before serving, no fish sauce and added the coconut milk at the last min (didn’t boil),I also forgot to add the peanuts I bought, naughtily I used supernoodles (without seasoning- people think I’m gross but I love them and added jalapinos! The options with this are endless it’s such a good base to create unique quirky ramen. The peanut butter was not over whelming but added such a good flavour. Loved it! I’m a not a chicken lover and have always prefured the meat free alternatives or other meat and Had the quorn bits to use up but will try with pork I thibk next time and possibly top with eggs. I am so glad you loved this Mia!! Thank you! This was my first instant pot recipe and it was absolutely delisious! I used minced garlic and ginger so prep was pretty quick. Will definetely make again! Made this for first time tonight and it was awesome! The flavor of the broth tasted like it must have simmered for hours upon hours and it was ready start to finish in under an hour. I added a soft boiled egg as an option to the finished bowl and it worked well. My wife is taking another bowl of soup to work tomorrow and I will be making this again soon! Hi Todd! I am so glad this turned out amazing for you! Thank you for trying this! I followed the recipe exactly, aside from substituting zucchini for the mushrooms (as always… none of us are fans of mushrooms here). Healthy, super flavourful and waaaaay easy! I am so happy to hear that sheri! Thank you!! I made it and had to substitute some ingredients but all in all it was delicious, easy to make but a bit more time consuming (I made it stovetop). I would recommend cooking the noodles separately and adding the soup-like ingredients over the noodles when ready to serve. I used 3 packets of the brand of noodles you recommended and they broke apart and got soggy. Hi Karin! I am so glad this recipe turned out so well for you! Thank you! This was absolutely amazing! Thank you so much for the recipe. It is -25 here in Toronto and I was feeling something warm for dinner and this dish did the trick. Thanks for posting it. Thank you Attie! I am so glad you loved this! This looks amazing. My family loves ramen, but doesn’t like coconut. I’m struggling to find a ramen recipe without it. Is there anything I can substitute for the coconut milk? Regular milk maybe? Or do you have any other suggestions? To store the noodles separately for left overs, would you still add in all the noodles the night you cook the dish, then try to remove the noodles for storage? 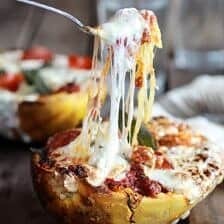 I am making this tonight for me & my husband but we wont eat the whole pot, so I’m wondering if I should add noodles to the instapot or do it on a bowl by bowl basis? Not sure how that would work!? Thanks! Thank you!!! this was amazing, we will be making this over and over again. I made this for my family tonight and everyone enjoyed it, especially my 8 and 9 year old boys. I will definitely be checking out more of your recipes as I found this easy to make and very tasty. Cheers! That is so amazing! I hope you love every other recipe you try! Delicious comfort food on a winter day! Lots of ingredients to assemble but easy to make! Hi Denise! I am so glad you loved this ramen and yes, such a perfect comfort food! Thank you for trying it! This is THE best instant pot recipe I’ve made to date (and I’ve made a lot). Unbelievably delicious. It’s a weekly staple in our household. I am so glad you all love this ramen, Jada! Thank you so much! I’ve made a similar dish before but had never thought about adding peanut butter! It was such a great addition!! I minced the ginger with garlic and sautéed them before adding mushrooms and peppers and then curry paste (I just like a little color on everything first!) I found the noodles at whole foods and was pleasantly surprised by how delicious they were, with a nice texture too. Thanks for upgrading my regular ramen soup recipe! I am so glad you loved this, Emily! Thank you for trying it! Just finished making this and it definitely gets a big thumbs up. Next time, I’ll probably up the spice level just a bit, and I might stove warm the red peppers and then put them in while it’s on sauté. No one but me liked the toasted sesame oil-oh well-I liked it. I might try bok choy instead of spinach and see what that’s like, but the spinach was fine. Really a great, hearty soup, and very highly recommended. I’m not sure what the two who were concerned about the prep time were upset about-it took me less than ten minutes to mince the garlic and ginger, cut the peppers, and slice the mushrooms. Hi! I am so glad you loved this recipe and it turned out so well for you! Thank you! Thank you so much Marina! This was insanely delicious !! !Super easy to make and tastes like something I would get at a restaurant . Perfect for a freezing cold night in Ohio ! I will definitely be making this again and again and again . Thank you ! I am so glad you loved this and it was perfect for the weather over there! I hope you’re staying warm! Thank you so much! This recipe was insanely deliscious ! It was super easy to make and perfect for a freezing cold Ohio night ! Tastes like something I would get at a restaurant … I will definitely be making this again !! I wonder if wow butter would substitute for peanut butter due to a nut allergy. I am sure it will be great, but I have not tried it! I hope you love it! I loved this, but more importantly, my picky fiancé also loved it! I actually didn’t even have all the ingredients on hand, namely fish sauce, lime juice and cremini mushroom, but I just used regular baby bella mushrooms and followed the rest of the recipe and it came out wonderfully. I can only imagine how much better it will taste when I do have all the ingredients. We will definitely be adding this soup to our regular rotation!!! I am so glad you both loved this recipe Charline! Thank you so much! Absolutely. Delicious. This will be one for the regular rotation! Thank you for sharing! The best meal I’ve had all week. Wow that is so amazing to hear! Thank you Stephanie! So incredible! My husband said, ramen for dinner? And then couldn’t stop talking about how good it was. We have cooked with red curry paste before and know to use less than the recipe calls for for our tastes, so used only 1 tbsp and it was still the perfect spiciness. You can always add more, right?! Your recipes are just winner after winner! Thanks, Tieghan! Thank you so much Jen! I am so glad you loved this recipe!! This was so so good!!! I made it for my entire family, including a 9 and 7 year old. Everybody loved it! Thank you for the great recipe!!! Absolutely love this recipe! I share it whenever I can and have made it almost every other week for the past few months. Kids love it as well. I add the noodles as I serve and eat; often leaving them out (for lunch/leftovers) and enjoying it just as much without them.Thank you!! Your approach on this soup is amazing but, oh well, maybe you didn’t know u have people all the way from Romania reading ur recipes and I can’t really understand anything from the measurements. It would be nice if u would add European ml or liters. Thanks. Keep up with the good work! Hi Alex! I will try to convert for you guys, but I find online converters to be easiest! I hope you try this! 1) Use only 1 and at maximum 2 blocks of noodles. If you use more, it’s more like a pasta dish, not a soup. 2) Cook the noodles separately and store the leftovers separately (as you do mention!) or your ramen will be mushy. 3) Use half the peanut butter, and add more to taste. I felt it was too much. 4) Thin with broth or water if too thick. As I sai, the flavors are amazing, so thank you for the recipe – I can’t wait to get it right! Super yummy. I had it the last two nights. I must say it was really spicy last night almost burn your lips off spicy. I wonder if I did not mix it well enough for tonight it was just right. Still may lay off the red paste. Maybe its just because we have such a large Asian influence up here and buying from the Asian market. You get the fresh stuff and it’s P to the O tent! This is the first time I’ve ever commented on a recipe but it was that good! I made it in my one pot and it was outstanding. My husband and two teens loved it.I followed the recipe exactly except for two changes: I used regular mushrooms instead of cremini mushrooms and mushroom broth instead of chicken. The broth was so good. It’s now on our regular rotation list. Any suggestions for a substitution for mushrooms? Thanks! So drool inducing! I usually only keep all natural peanut butter in the house, will that work? Or would something like Jeff or Skippy be more appropriate here? I made this last night. This is so delicious! Tieghan you are a flavor master! Keep these great recipes coming please..I am a huge fan. I felt I HAD to make a point of leaving a review of this ramen, because it’s DELICIOUS! I Find often with recipe reviews, there are tons of comments about how much everyone wants to make it and how good it looks, but less discussion about how the recipe actually turned out. We’ve made this dish 2 or 3 times now, in our Instant Pot as suggested, and each time, it has come out perfectly. It’s amazing for our long, cold eastern Canadian winter nights. It’s so flavourful and hearty enough to be a very filling meal all on it’s own. ! It’s one of the only make-at-home ramen recipes I’ve actually loved, recommended to others, and made more than once. We often use Udon noodles to mix things up. We also like to put the fresh lime juice in right before serving to preserve freshness. Love this recipe, I make it basically every other week! Delicious! Excellent recipe. I used 3 packages of noodles. It did soak up the suit. Added 1/2 carton of Thai soup to the left over portion after we ate it and it was delicious. I also used rotisserie chicken. Made this for dinner and it was amazing! It’s my new super easy go to dinner recipe. Made this for supper on this cold, snowy night. It was delicious and very easy to make! Will definitely be making this again. Thanks for the recipe!! Best soup ever! Bursting with flavoured, easy to make, simple and healthy ingredients. Add a little hot sauce if you dare and delicious. This is a keeper. I have made this twice in the last two weeks, fast, easy, everyone loves it and I brought it to work for lunch all week. My daughter watched it all go in the pot and looked at me like I must have read the recipe wrong. Then she had her face in the pot because it smelled so good! Perfect recipe for a cold and cold weather. Thanks so much! I just recently got an instant pot. I’ve been having fun trying recipes. This one is one of the best so far! I added onion, a jalapeño, and a bit of crushed red pepper because we like spicy foods. But otherwise stayed on the recipe. Delicious, easy, quick. And perfect for a grey, rainy day like today. My wife said it’s every bit as good as what we get at the local Thai place. Made this for Valentine’s dinner and it was a hit! Will definitely put this one in our cold night/warm dinner rotation! Thank you so much! Thank you so much Kari! I am so glad this turned out amazing for you and I hope you had an amazing Valentine’s Day! Please include Nutrition Facts on all recipes. Made this on Monday (minus mushrooms). Possibly one of the best recipes I’ve ever made. Great job! We absolutely loved this recipe. Iv made dozens of Thai dishes (it’s my latest obsession) and this one has been my favourite! There is no way the prep times given on this recipe are accurate. They are misleading. All you have to do is add up cooking times and you are over not to mention having to easily double the prep time to get everything ready. Not a fast meal to make but well worth the effort if you have the time. Very tasty. My boyfriend and I made this on the stove and we LOVE it! I never knew homemade ramen could be so easy, and healthy! I’d like to try making this in the Slow Cooker to make it even easier for weeknights. What cook times/setting and changes would you recommend for making this up in a Slow Cooker? Hi! I have cashew butter on hand, Would that substitute nicely or should I stick to pb? Either is fine. I made this today for lunch, it was AMAZING and easy. Thank you!!! I made this last night in my instant pot and my boyfriend raved that it was the BEST thing I’ve made (to date)!!! it was so easy to whip up, and full of flavor (and healthy to boot)! had some issues with the noodles, though. I cooked them separately but once they cooled down, they stuck in a giant clump (I used plain ol ‘rice noodles’). any suggestions to avoid this would be great! thanks for the hit recipe! Just…wow. I can’t believe the flavor for how easy this was to make. This does not taste like a healthy weeknight meal, this tastes restaurant-quality! Thank you for sharing this wonderful recipe! Used Pad Thai noodles because that’s what I had on hand. Came out delicious! Will be adding this to our rotation. But prep time was nowhere near 15 minutes. After prepping and measuring all ingredients, this is a 30 minute meal – just something to keep in mind if you’re in a hurry! My hubby picked out this recipe and I put it together last night. OH. MY. GOSH. It was so easy and so delicious! My 1 year old devoured it! Will definitely be making again. I LOVE this recipe and have made it multiple times. However, this time the coconut milk separate. Doesn’t change the taste but not as attractive when you dish it out. Any idea what I did wrong this time? HI there! Did you do anything different? Did you use full fast coconut milk? I have never had the coconut milk separate so I am not sure what is happening without know ho you have cooked this. Hope I can help! I’ve been looking for this recipe for soooo long!!! I dined at a restaurant that served curry Raman that tasted just like this! I am moving away soon and I was going to miss this dish so bad… so I was on the hunt for a curry Raman using peanut butter and coconut milk… THIS IS EXACTLY IT! The only thing I did different was I didn’t use spinach and added cayenne powder. AMAZING! Have made this several times, it’s now in my “tried and true” stack of recipes 🙂 Great flavors, and love making this with some Shin ramen noodles! Love love love! Took a little longer but worth it for sure. Any idea how many Weight Watchers Smart Points this is? This was soooo tasty and delicious! And a super bonus that it’s made all in one pot and in such a short time. Thanks for sharing! A friend made this for me and since then I’ve made it and shared it with others. Ramen noodles go so well in this curry! I sometimes make this with a different curry paste, like panang, have once tried cashew butter and I add some lime leaves when I can get them. This recipe is a staple in my household. I made this for dinner last week and my husband and I LOVED this recipe. I added a sliced jalapeño for a little heat. This has become my husband’s #1 meal of choice as he devoured 2 bowls and kept asking me if this was going to become one of my go-to recipes. I assured him it was. We love Thai food, so I was thrilled that this recipe was so easy and filled with flavor! Love this recipe! I left out the mushrooms and bell peppers, but it still turned out amazing. I cooked the chicken in a separate skillet and seasoned it with curry powder and added it once it was done cooking. A-MAZ-ING!!!! Even my husband loves it who is a VERY finicky eater. Makes me feel good he is getting some veggies. Thank you for creating this! Hi Lindsey! I do not provide the nutritional information for my recipes because I truly try to use whole ingredients as much as possible. I am so sorry for this. There are many calorie counting apps and websites where you can put in the information and divid by the serving size to find out the carbs, fat etc. If you have any other questions please let me know! I hope you love this recipe! This was FABULOUS! Loved it so much I made it again this weekend to have for the week! I agree the timing was off for prep, but no matter, I will be making this often! I (almost) can’t wait till Fall, so I cam make so many of your warming recipes!! I’ve been obsessed with making ramen for a while – have tried all different methods and recipes. Loved this one. Amazing and will make again. Loved everything about it, Don’t love red bell peppers, so used poblano. Yum. Thank you!! Hi! Has anyone tried to make this in the crockpot? I have to admit I was skeptical about the mix of so many strong flavours (peanut AND curry AND soy etc) but this turned out wonderfully. I used tofu instead of chicken and green curry paste instead of red as that’s what I had on hand, and as suggested, cooked the noodles separately so I can pack for lunches for the week. This is my first time cooking one of your recipes; I will obviously be back! This recipe is on heavy rotation in my kitchen. It’s so simple and so delicious, and once you get the basics down, you can pretty much put whatever veggies you want in it. But honestly, as written, it’s perfect. The flavors are deep and powerful, and there are some really great textures happening here as well–the creaminess of the broth, the chewiness of the mushrooms, and the crunchiness of the peanuts! This was amazing and so easy! I omitted the honey and served it over zucchini noodles and I’ll definitely be making this again. HO-LY COW. This was so darn delicious. Easily adaptable to a vegan recipe too, which I think is great. The flavors together are so lovely. Nice and aromatic, creamy, not to mention the fact it makes so much food! This recipe has been added to my repertoire. I don’t have an instant pot but I have really been wanting to make this recipe! Do you have any suggestions? My husband and I love Thai food and I’ve made many Thai dishes. We loved this recipe. He loves heat so he added Sriracha sauce to his bowl. I find prep is made easier by the convenient bottles of minced ginger and garlic. I also used Chinese egg noodles instead of ramen noodles. I might have put too many noodles in, so I’d cut back next time. Tomorrow night for dinner I’ll reheat with more broth, coconut milk, peanut butter, fish sauce, soy sauce and curry paste to get more liquid. This was delicious! What is fish sauce & where can I buy it? Ok the ingredients look like shi* when you’re putting this together and you’ll start to wonder what the hell youre making!!! But it came out wonderful!!!! So delicious and warm and soothing on this cold and windy April night in Nrw England!! I’ve made this soup several times and it is delicious. My husband & I love all the great flavors & I love the easy prep. I have a difficult time finding ramen noodles that aren’t HIGH in sodium content. I’m going to try it with Chinese style LoMein noodles tomorrow. Sent your cookbook to my son as a gift. He is enjoying it!! Just made this recipe tonight in my Instant Pot, and it was very easy and tasty. I didn’t have the right noodle so I just used rice noodle, and it was equally tasty. Will do again for sure.. thanks for the recipe.